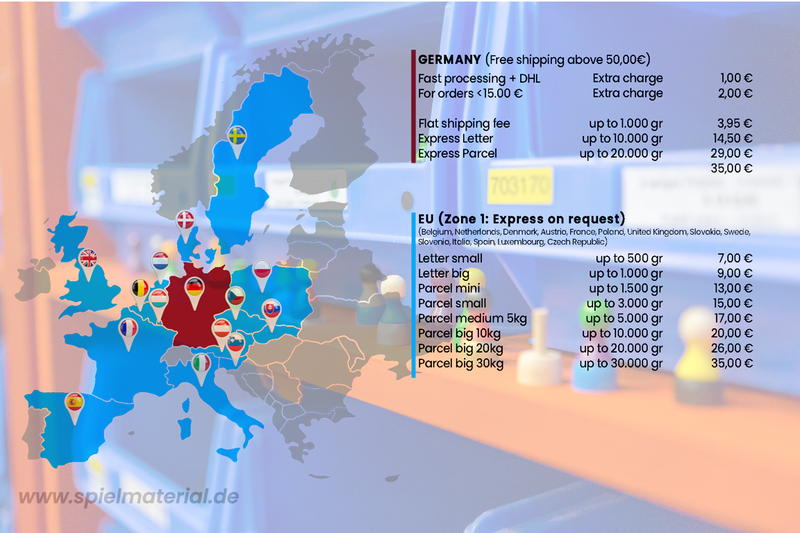 www.spielmaterial.de delivers to the following terms of delivery and payment, which apply in addition to our general Terms and Conditions (T & C). Orders are shipped by German postal service, DHL or Hermes. Goods that are in stock are usually shipped the next day. 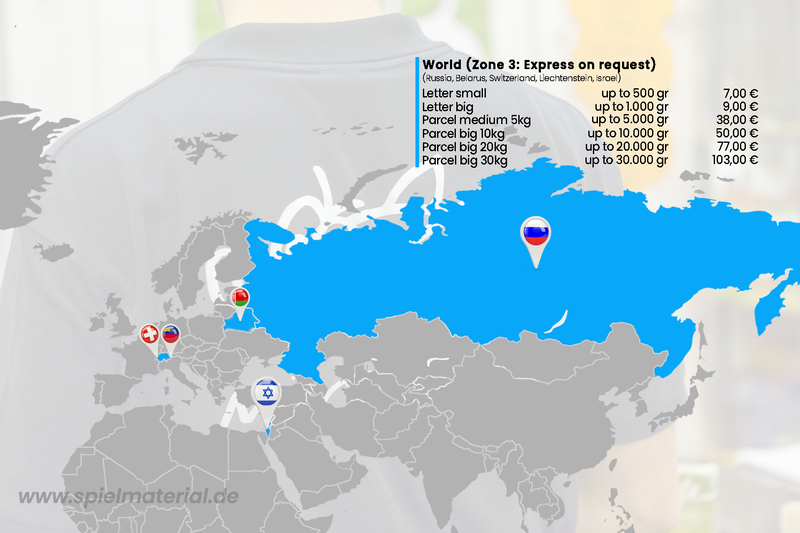 This results in Germany to a standard delivery time of 2-3 working days. Running times for other countries are different and depend on the volume of the order. Generally 4-5 working days within the EU and 4-7 working days worlwide are usual, however, there may be differences in some countries that are beyond our influence. Information can be obtained by us. If goods are not in stock, we strive for the fastest possible delivery. The delivery time is not binding if not confirmed by www.spielmaterial.de in writing. The customer pays for a delivery in Germany a flat delivery fee of 5 € (gross). Orders above 150 € receive a bonus of 5 €. Payment on delivery is not possible. If for technical or logistical reasons an order is processed in two or more shipments, the customer only pays once for shipping costs. In case of a return due to incorrect or incomplete address information made by the customer, a new shipment is done if the customer informs about his correct address and pays for the new delivery again. In that case, the delivery fee also has to be paid, if the order amount was good for free shipping. Alternatively, the customer is entitled to a refund of his payment, less a processing fee of 5 €. www.spielmaterial.de provides an extensive warehouse and ensures with a storage management the availability of the products listed in the shop. In the rare case a product is not available on stock, www.spielmaterial.de will strive for a fast delivery. If a product cannot be provided, www.spielmaterial.de can cancel the order. The customer will be returned his payment. Other costs such as customs duties, fees or import taxes can occur depending on the customer’s delivery country (mostly non-EU countries). Traders within the EU, by providing a valid EU VAT number can receive goods without German VAT. The purchase price usually is payable immediately with the receipt of the order and to be done within 2 weeks. New customers have to pay in advance. This can be done by bank transfer or PayPal. The goods are shipped after receipt of payment. 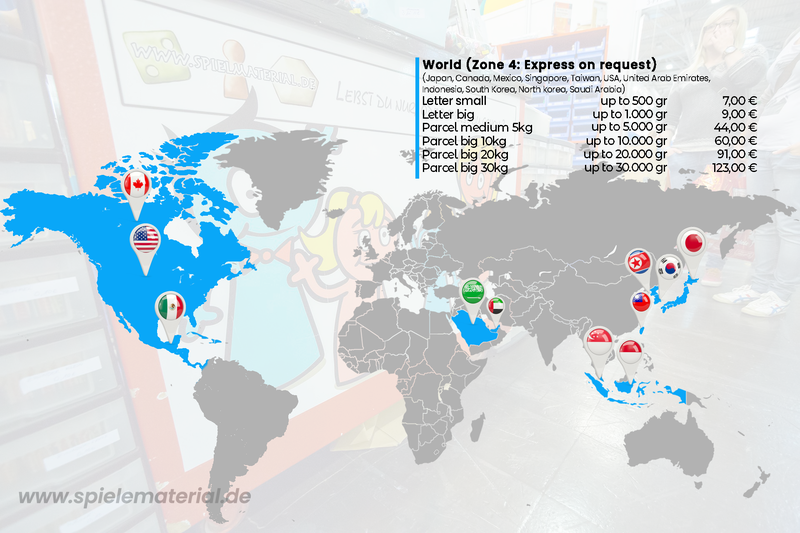 Shipments abroad are always sent after pre-payment. All prices are final and include the applicable VAT (if applicable). Sofortüberweisung is an ISO certified online payment system based on online banking with the PIN-/TAN-process for secure and fast processing of online purchases. By now, most banks have since switched to the chipTAN process. Using the secure, for www.spielmaterial.de number not accessible system of Payment Network AG Sofortüberweisung (Klarna) provides bank transfers in real time. The purchase amount is thereby transferred directly to the bank account of www.spielmaterial.de. The customer authorizes the immediate transfer with entering his PIN and TAN. With Sofortüberweisung www.spielmaterial.de offers a fast, safe and easy payment method. The customer can choose the payment method in the order process. Sofortüberweisung works like a conventional online payment at the bank. The customer can handle the payment process directly from their personal online account. Directly after the customer in the last step of the order process checks the basket and clicks the “buy” button, the transfer process is started. In an already pre-filled transfer form (www.spielmaterial.de bank, transfer amount and order number and customer number as the reason) the customer has to enter their account number with the associated password, and its name, and then as usual confirm his transaction. After www.spielmaterial.de has received confirmation of payment from the customer's bank, the shipping of the ordered merchandise is made. At www.spielmaterial.de customers can also pay online by credit card. MasterCard and VISA are accepted as methods of payment. In the ordering process, the customer selects "credit card" as a payment method and selects the type of card (MasterCard or Visa). In the next step the customer is taken to the payment page of our payment partner "Payone", where the credit card number, security code and expiration date are entered and the order must be completed. Credit card payments are protected by a query of a secure code. These three digit security code located on the back of your card. PayPal is a subsidiary of US-based eBay, which under their brand name operates an online payment system. It can be used as a micro-payment system and for payment of medium and small amounts when buying and selling in online trading. The PayPal account is a virtual account: The identity of the PayPal account is defined by the e-mail address of the PayPal member, so there is no separate account number. With the account, payments to third parties can be made or received. PayPal acts as a service system for the transfer. PayPal is not a trustee. Thus merely the payment process is performed. An important advantage of PayPal is that payments made are immediately credited to the payee, and thus, for example, the usual duration of a bank transfer is eliminated. This shortens the delivery time, if the seller ships the goods promptly after the receipt of payment. PayPal members must first register with their personal information and account information and wait for the verification of the data provided. Then PayPal members can send money to any e-mail address in the supported countries. For the customer, the payment via paypal is free. PayPal payments are to be made here at info@spielmaterial.de. When chosing BitCoin as payment method, the client will receive the necessary payment data after placing the order in a separate mail.